No makeover happens overnight, as Bayside Marketplace proves. The downtown open-air market spanning almost 17 acres, which hosts over 180 businesses, plans to continue construction for the next three years. It unveils its progress as it goes along. Construction work dates to 2016 as the marketplace first looked toward updating its north building, which sits closest to the American Airlines Arena. Zyscovich Architects leads renovation efforts. “We started in the north building and redid our restrooms, which were in dire need of being renovated and remodeled,” said Pamela Weller, senior general manager at Bayside Marketplace LLC. With new banisters, fans, fresh coats of paint, LED lights and an added structure to the neutral piers, that wing stands at 85% complete. Custom-made awnings provided by Miami Awning, the same company that provided the original ones 31 years ago, will take the team to 100% completion in four to five weeks, Ms. Weller said. Ms. Weller confirms plans moving forward with the SkyRise observation tower on the bay just off the marketplace’s water side. Its developer, Jeff Berkowitz, leads construction work behind Hard Rock. Developers expect to complete the observation deck by 2020, including its attractions, among them a zero gravity tunnel and a transparent slide. City of Miami residents approved financially supporting the project in a referendum vote in 2014. Ms. Weller says Bayside can work within a $27 million to $34.5 million budget. Ms. Weller said she looks forward to the final product in a few years. “It’s really an evolution of connectivity between each of the areas, but the final project will be within the next three years,” she said. Being in the shopping center industry, her team did not want to disrupt tenants’ flow of business, so work begins at midnight Monday through Thursday. “All of our work is being done at night, which limits us being able to move quickly throughout the project because of the lighting and other variables when you have an open shopping center,” Ms. Weller said. Other than the addition of new awnings, Ms. Weller looks forward to the two next steps. “We started working on our pavilions.” she said. “We put on these new polyurethane roof structures that are actually special orders for us from Italy. It’s a green polyurethane roof that actually has LED lighting behind it. It takes us about four weeks to do each pavilion.” She said updated LED lighting should come to the entertainment stage soon too. 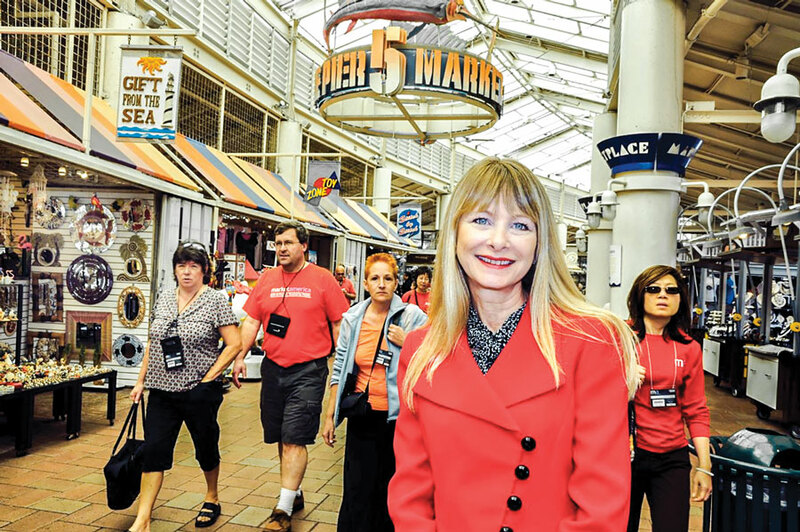 While Bayside Marketplace remains the number one attraction in Miami, Ms. Weller says, and ranks fifth statewide, some locals believe the changes to the open-air market will attract more Miamians. Zach Winkler, senior vice president and retail lead for South Florida at commercial realty firm Jones Lang LaSalle, says the site primarily draws tourists and cruise passenger traffic. The pool of visitors may widen with the changes, Mr. Winkler said.